On Sunday, the last of the Fall 2014 German lagers was finished brewing; at present, only fermentation and packaging are left. 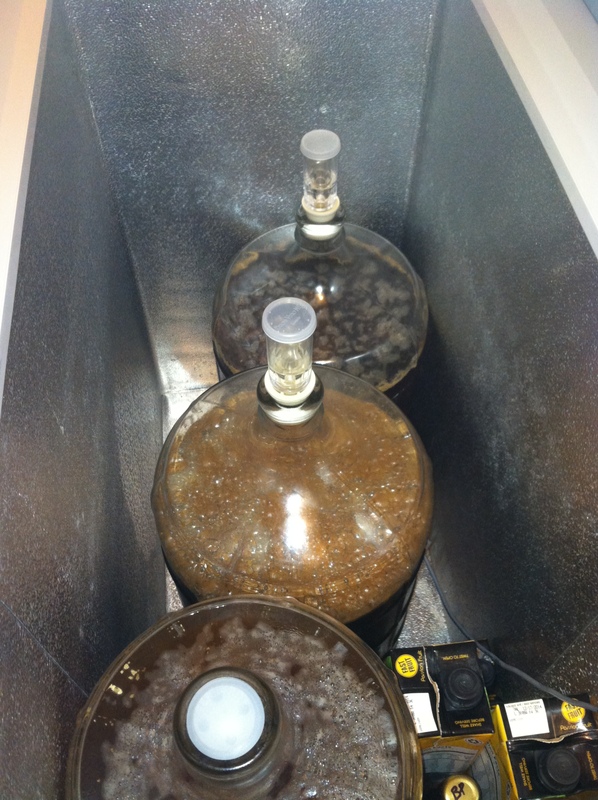 As seen in the picture, both the 2014 Summer Solstice Helles Bock and Oktoberfest fermentations have visibly slowed, while the Schwarzbier, brewed on Sunday, is at high krausen. To my knowledge, I’ve never seen a chocolate milk looking krausen, even among my stouts and porters. Hopefully, this is a good sign. Also seen in the picture, for the first time ever, I’ve completely filled my temperature-controlled chest freezer full of carboys. As pictured, the chest freezer is a GE-brand 7 cuft in design, and empirically demonstrates the ability to handle two six-gallon carboys and one three-gallon carboy. For those who enjoy TMI: the three-gallon carboy is seated on top of the compressor hump with a silicone bung used as the airlock. Lager fermentation should wrap up next week, then onto a diacetyl rest. From the looks of it, I have many kegs to clean, but that is a good thing. Additionally, I am looking forward to changing yeast strains from German lager to California lager. In the planning is a SMaSH Blonde ale using Czech floor-malted pilsner malt and Hersbrucker hops, ready for the mid-summer weather. After that, I’ll save the yeast and make an Anchor Steam clone, a nice beer for the summer-fall transition. In other updates, I recently posted the Farmhouse IPA brew day. Originally, I was only planning tasting notes, but then realized I had too much to say about the recipe design, so then decided to write about the brew day. Occurring in mid-May, the brew day was loads of fun, especially when 4 oz of Saaz hops are involved. Since then, the brew has been kegged and conditioning for six weeks. At present, the Farmhouse IPA is tasting quite nice. Expect tasting notes soon. In other news, the Apartment Homebrewer is now on Facebook. The new page linked here and below features updates from the blog as well as additional content, such as post previews, live brew day feeds, and pretty beer pictures. More conveniently, you can follow me by pressing the like button on the right side of the page. For those not on Ye Book of Faces, you can also follow me on twitter @apthomebrewer. Independent of your social media preference, both venues are great to ask brewing questions and/or blog post requests. Please visit the Facebook page; since it’s new, it looks very blank and lonely. How was your week in brewing, and are you brewing anything for the Fall? Leave your experiences in the comment section below. As always, cheers, and happy brewing! Hi my name is Alex (AKA RockonBeer). I am a new reader and just wanted to let you know I am enjoying your stuff. Cool to see someone writing about apartment homebrewing. I really wish I had know about your blog back when I was brewing in my apartment. Have you posted your recipe for the schwarzbier? It’s my favorite lager style and I have been wanting to brew one forever. Hey, thanks for the kind words and your readership! I have not posted my Fall 2014 German lager recipes yet, though soon. At present, these beers are lagering. From my brew logs, the schwarzbier recipe was approximately 60% pilsner malt, 30% munich, 10% dehusked carafa ii, ~25 IBU, some late mittelfruh, and bohemian lager yeast. I’ll let you know how it turns out. Cheers! Cool, thats about standard from my research. I’ll probably get thrown in the sea if I take up the brewhouse’s fridge with a lager though. Everyone is busy brewing their hoppy summer ales. One of the few drawbacks of joining a group brewhouse.